New Years Eve turned out to be quiet, nostalgic and satisfying. 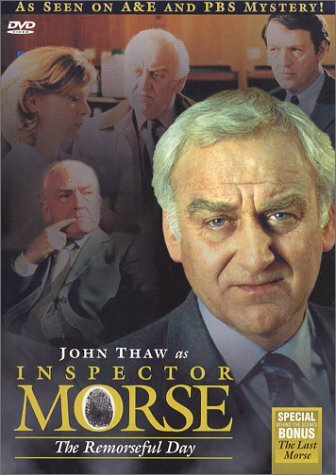 Our tv supper (yes, with just the two of us, this is how we do supper) turned out to be a visit with Inspector Morse. As we tuned into Britbox, the documentary, The Last Morse, came on the screen, so we clicked on it. Although we have seen all Morse episodes, we had never seen this doc that was made way back in 2000 to go along with the very last of the 33 Morse episodes which ran from from 1987 to 2000. We love this series with the somewhat curmudgeonly Morse and his likable partner, Lewis, to the point where we, somewhat in jest and somewhat not, tend to judge all series against this one. "It's not Morse," is commonly repeated refrain in this house when a new series is found wanting. After that trip down Memory Lane, we tuned into the very first episode, The Dead of Jericho and loved it all over again. Perhaps we will watch the other 32 episodes again and perhaps not. We shall see. There have been two spin-off series. Lewis ran from 2006 to 2015 and coincidentally also ended up with 33 episodes. It was also a very fine series, and we never said, "It's not Morse." We do want to watch all these again but can only find the initial episode, the pilot, on Britbox. The other spin-off is Endeavour which features a young Morse in the 1960s. From 2012 to present there have been 5 series with a total of 23 episodes if one includes the pilot. A 6th series will hit the airwaves in 2019. Since we no longer get live tv, we are, regrettably, a little behind with this show. That a tv series that began in 1987 has two successful spin-offs says quite a lot in my opinion. I have often felt that Inspector Hathaway (Lewis's sidekick) could be a very good spin-off from Lewis, but it doesn't seem to be in the cards as they say. Best wishes to you both for a Happy New Year! Inspector Morse is one of my favorites as well so you & Sue had a great way to usher out 2018. We no longer have live TV service as well and Acorn TV and Netflix are streaming choices as well as YouTube. I've never watched the series. I spent New Year's Eve at a Scottish New Year's event at Lansdowne Park. Love the Morse and Endeavour series. We still get live TV for if we didn't he wouldn't have any high speed internet for his work. Boy, it get's expensive. We bought all these DVDs! We like the Brittish peeps!